Seabrook Island is a quiet gated community about 30 miles from Charleston, SC. A visit to Seabrook is one giant photo opportunity. The wildlife is protected and roams freely. Alert photographers will be awestruck at the opportunities for fantastic snapshots. Catch a super photo of seagulls in flight, dolphins in the ocean waters, wandering deer, fast little foxes, and fascinating alligators. You will not find big hotels or heavy traffic at Seabrook. But you can rent a villa for a week or a few months. Over 700 families live at Seabrook full time--full time residents outnumber the visitors. That's one of the things that makes Seabrook so special. If you want to enjoy the hustle and bustle of city life and historical tours, visit Charleston for a day. But after your day of sightseeing, come home to Seabrook. And relax! Have you ever visited the South Carolina coast? Yes, I have visited the beautiful SC coast and Seabrook Island. Yes, I have visited the SC coast, but I have not been to Seabrook Island yet. No, I have not visited the SC coast or any other Atlantic coast beaches. No, I have not visited the SC coast, but I have visited other Atlantic coast beaches. Sure sounds like fun to me! 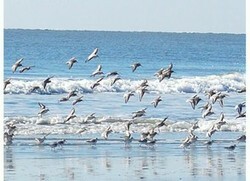 Seabrook Island is on my bucket list! Wake up very early in the morning and go to the beach. Early shell seekers find the most treasures. Pelican Beach is actually on the North Edisto River Inlet and is my personal favorite. They say that relaxation is a requirement on Pelican Beach, and indeed you will feel yourself relaxing from the first moment you see it. Uncrowded and peaceful, Pelican Beach is next to the beautiful new Seabrook Island Clubhouse and swimming pool area. North Beach on the Atlantic coast boasts one of the widest beaches in the Carolinas. You will enjoy the huge sand dunes, too. Seabrook is blessed with an abundance of trees - Oaks, magnolias, palm trees and pines cover the island and provide wonderful shady areas for walking trails. You will want to drive 3 or 4 miles down the road to visit the famous Angel Oak - a beautiful 1500 year old oak tree. Again, remember to take your camera. Over 80 species of birds inhabit the island of Seabrook - including the bald eagle. The Seabrook Island club takes top honors each year in the Audubon Cooperative Sanctuary, North American Bird Watching Open. One of our favorite activities in the early evening? Watching the ospreys roost for the night! Between Seabrook and Kiawah Islands, Freshfields offers restaurants, grocery store, and a wide array of boutique shops for your shopping pleasure. Just a few miles from Seabrook is the beautiful tea plantation. Ride the little trolley and see it all. Have Fun on the Beach! No matter what time of year you visit Seabrook, there is always fun on the beach. Pack a picnic and join the folks enjoying the gorgeous sunset. Play bocci ball or fly your kite. Walk along the beach and keep your eyes open for dolphin strandings. Would you enjoy a visit to Seabrook? Thank you for the introduction to Seabrook island, I had never heard of it but it looks like a beautiful place to visit. This looks like my kind of place! Wildlife and nature trails...what could be better than that? I love looking for shells on the beach. This sounds like a great place for pure relaxation! For sure, Kate! one of my favorite memories of that trip was you with your iphone out on the deck playing music to call the gators - and it worked! I am one of the lucky ones. Not only have I visited Sea Brook Island, but I visited there with you, dear Joan! It's where had my first experience with Alligators!! Seabrook is lucky to have you as an ambassador! Looks like a beautiful place. I would love to watch the birds too. I love the coastal cities. I have not ever been to the Carolinas, but it sure looks beautiful. You've enticed me. The state dance of South Carolina is the shag. Originating at the beach in the 1940's, everybody in SC shags, from the little ones to grandparents! Come join us! 2016 will be the 5th annual Pendleton Scarecrow Contest and all scarecrows must be in place by noon on October 18th and an entry form must be turned by October 5, 2016 at 4 pm.